Researchers have taken advantage of the unique coupled semiconducting and piezoelectric properties of zinc oxide nanowires to create a new class of electronic components and devices that could provide the foundation for a broad range of new applications. "Nano-piezotronics utilizes the coupling of piezoelectric and semiconducting properties to fabricate novel electronic components," said Zhong Lin Wang, a Regents Professor in the School of Materials Science and Engineering at the Georgia Institute of Technology. "These devices could provide the fundamental building blocks that would allow us to create a new area of electronics." For example, in a nano-piezotronic transistor, bending a one-dimensional zinc oxide nanostructure alters the distribution of electrical charges, providing control over the current flowing through it. By measuring changes in current flow through them, piezotronic sensors can detect forces in the nano- or even pico-Newton range. Other piezotronic sensors can determine blood pressure within the body by measuring the current flowing through the nanostructures. And, an electrical connection made to one side of a bent zinc oxide nanostructure creates a piezotronic diode that limits current flow to one direction. Development of a piezotronic gated diode based on zinc oxide nanowires was reported February 13 in the online advance issue of the journal Advanced Materials. 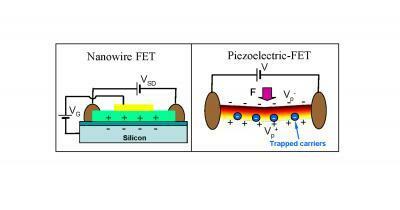 Other nano-piezotronic components have been reported in the journals Nano Letters and Science. The research has been sponsored by the National Science Foundation (NSF), Defense Advanced Research Projects Agency (DARPA), the National Institutes of Health (NHI) and NASA. "The future of nanotechnology research is in building integrated nanosystems from individual components," said Wang. "Piezotronic components based on zinc oxide nanowires and nanobelts have several important advantages that will help make such integrated nanosystems possible." - Zinc oxide nanostructures can tolerate large amounts of deformation without damage, allowing their use in flexible electronics such folding power sources. - The large amount or deformation permits a large volume density of power output. - Zinc oxide materials are biocompatible, allowing their use in the body without toxic effects. - The flexible polymer substrate used in nanogenerators would allow implanted devices to conform to internal structures in the body. - Nanogenerators based on the structures could directly produce power for use in implantable systems. - In comparison to conventional electronic components, the nano-piezotronic devices operate much differently and exhibit unique characteristics. In conventional field-effect transistors, for instance, an electrical potential – called the gate voltage – is applied to create an electrical field that controls the flow of current between the device's source and its drain. In the piezotronic transistors developed by Wang and his research team, the current flow is controlled by changing the conductance of the nanostructure by bending it between the source and drain electrodes. The bending produces a "gate" potential across the nanowire, and the resulting conductance is directly related to the degree of bending applied. "The effect is to reduce the width of the channel to carry the current, so you can have a 10-fold difference in the conductivity before and after the bending," Wang explained. Diodes, which restrict the flow of current to one direction, have also been created through nano-piezotronic mechanisms to take advantage of a potential barrier created at the interface between the electrode and the tensile (stretched) side of the nanowire by mechanical bending. The potential barrier created by the piezoelectric effect limits the follow of current to one direction. Nanogenerators, which were announced in the April 14, 2006 issue of the journal Science, harvest energy from the environment around them, converting mechanical energy from body movement, muscle stretching, fluid flow or other sources into electricity. By producing current from the bending and releasing of zinc oxide nanowires, these devices could eliminate the need for batteries or other bulky sources for powering nanometer-scale systems. Piezotronic nanosensors can measure nano-Newton (10 -9) forces by examining the shape of the structure under pressure. Implantable sensors based on the principle could continuously measure blood pressure inside the body and relay the information wirelessly to an external device similar to a watch, Wang said. The device could be powered by a nanogenerator harvesting energy from blood flow. Other nanosensors can detect very low levels of specific compounds by measuring the current change created when molecules of the target are adsorbed to the nanostructure's surface. "Utilizing this kind of device, you could potentially sense a single molecule because the surface area-to-volume ratio is so high," Wang said. Written from a news release by Georgia Institute of Technology Research News.